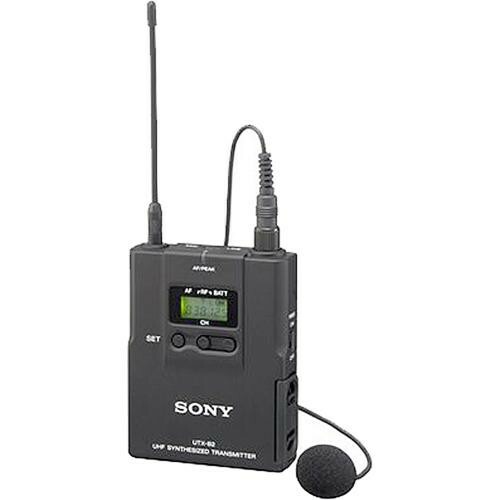 The Sony UTX-B2 is a wireless bodypack transmitter for the UWP series wireless microphone system. Users are able to choose from 5mW output, which is suitable for simultaneous multi-channel operation or 30mW output for long distance transmission. The transmitter features selectable RF-output level providing added signal strength at long range. The bodypack transmitter features 188 selectable UHF frequencies and operates up to 10 hours on two-AA size alkaline batteries (10mW output power). An LCD display and a 3.5mm input jack is switchable between mic- and line-level signals. 188 user-selectable frequencies provide plenty of options when interference is present. A comprehensive LCD display provides channel and frequency information, battery life, total usage time and more. Box Dimensions (LxWxH) 9.8 x 5.8 x 3.1"
UTX-B2 Bodypack Transmitter for UWP Series Wireless Microphone Systems Frequency Group 42/44 (638 to 662 MHz) is rated 4.5 out of 5 by 2. Rated 5 out of 5 by Anonymous from Much better than the older model We ordered this to replace a unit that is now in the FCC's do not use list. We had no issues with the old beltpack transmitter but I must say that this new seems to be much better built. Instead of plastic, it is a nice solid black metal. The performance is excellent as well. Rated 4 out of 5 by jimmypgh130 from Works Well I have two of these one 38 and one 42. The 38 always works well. The 42 seems to frequently have static when someone talks. This could be because the body pack was dropped too many times. So I bought this new one. So far I have had no issues. I bought the other sets in 2010. Hopefully my issue is solved since they have discontinued this model. The Sony URX-P2 will receive signal from any single Sony UWP series transmitter that is operating within the same frequency range. How can I replace a worn out lav mic cable for this transmitter? Just purchasea new Mic in the b&amp;h store.. They have several selections and haven't had an issue in the past before when buying a new lav Mic. Is this compatibile with URXP03? The older Sony UWP components such as the UTX-B2 are compatible with the newer UWP-D series components. The URXP03 will need to be set to the proper compander settings in the advanced menu in order to communicate however. This operation can be found in the UWP-D operation manual. Can multiple Sony transmitters/mics be used with a single receiver unit? Assuming that all units share the same frequency group. I think that they have in the menu a set in which this is possible. In the Menu say L or H , using the L it should work.Keep the finger in the set bottom and turn on the transmitter, then puch set bottom until rich the : PO H, puch the minus bottom and it will change to PO L. Any how, I will recommend to have every transmitter with there own receiver.